An "usie" on the Brooklyn Bridge. What do you call a group selfie? An usie, of course! As in "us." Pronounced uss-ee, rhymes with fussy. "Usies are a growing trend that I think have far more social value than selfies," said Michal Ann Strahilevitz, a professor of marketing at Golden Gate University in San Francisco who studies consumer behavior. "It's magical capturing moments we share with other people." In contrast to one-person selfies, usies are "more about the relationship, and less about you and your hair," she said. 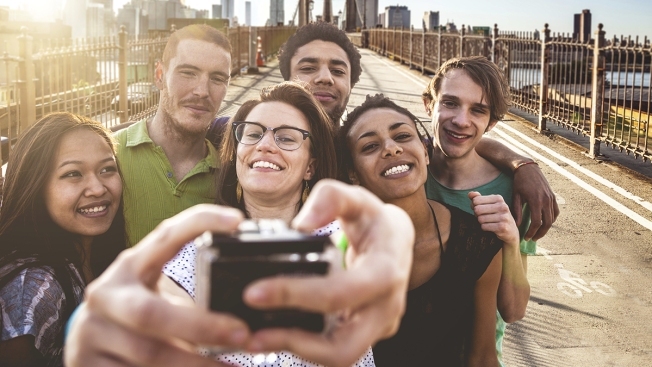 The word — sometimes spelled usie, sometimes ussie — has been showing up in written material since at least April 2013, according to Ben Zimmer, executive producer of Vocabulary.com and language columnist for The Wall Street Journal. A Business Insider story from January noted that the outstretched arm of the photo-taker in usies is a "signature" of the image, because the shooter has to get the camera far enough away to get the group in the frame. The Times of India in March said Pope Francis' group selfie with visitors at the Vatican last year "could possibly be the first chronicled celebrity usie." And a PopStopTV.com report from June was headlined: "Selfies Are Dead, Usie is the Latest Trend!" But the term is so new and relatively obscure that it wasn't used to describe the famous group selfie of Ellen DeGeneres and other celebrities in March during the Academy Awards. "There are countless variations on the theme, including 'twofie,' 'threefie,' et cetera, if you want to specify the number of people photographed," said Zimmer.